The Electra iOS 11 jailbreak’s rollercoaster ride has taken another twist as CoolStar’s tweeter handle disappears from the Twitter. However, the latest tweet from developer nullpixel confirms that Cydia for iOS 11 on Electra jailbreak will surely get a public release. The developer of the Electra jailbreak, CoolStar recently announced that he will be quitting the iOS jailbreaking scene completely after multiple builds of his Electra with Cydia were leaked online. The developer had reportedly made builds available to developers for getting all their tweaks ready before the Electra iOS 11 jailbreak with Cydia public release. Unfortunately, one developer leaked the multiple builds to the public domain. After that, CoolStar announced that he was done and deleted his Twitter account. After this bad news jailbreak enthusiasts made up the mind that they could not see the Electra jailbreak with Cydia as the CoolStar needs to be involved in that release. However, the latest information from developer nullpixel, who is said to be working on the Cydia for iOS 11 alongside CoolStar reveals that final build for Electra jailbreak will actually be finished, with or without CoolStar’s participation in the project. Later in a follow-up tweet, the same developer has confirmed that CoolStar will certainly have a hand in making Electra ready for public consumption. At moment, it’s not clear on for what reason the Electra RC1 versions were leaked. 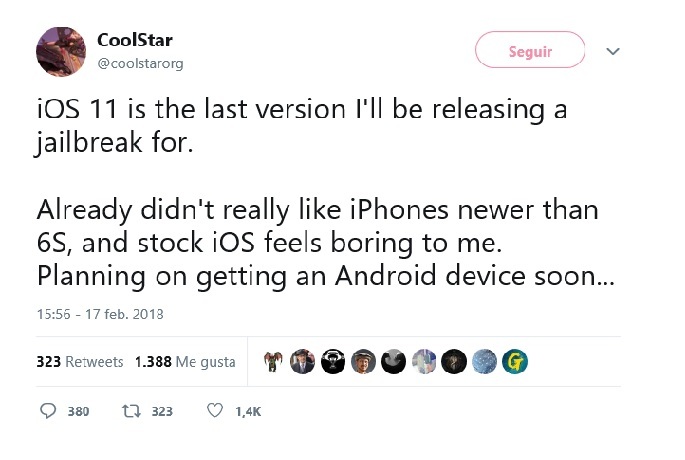 Although CoolStar’s Twitter account still remains deleted as of writing this, jailbreak community can only hope CoolStar does return to the fold eventually – both in order to complete the work on Electra and to take the applause he deserves for making the final build of Cydia for iOS 11 jailbreak available at all.